A booking form is a way to tell another department what you need and when you need it, plain and simple. How do you predict when and how your test environment services will be at a premium? The ebb and flow of business cycles will inevitably cause uneven demands. For example, the end of the year is a busy time for HR as they prepare for a new year of benefits and ever-changing regulations. In contrast, the server management department might be in high demand after Patch Tuesday*. A buggy patch can wreak havoc! These business cycles affect the flow of demands on the test environment. ITIL recommends that we not only measure but predict demand. Demand management is essential for business. It is a primary part of the Test Environment Management Use Case and falling short of demand means not being able to deliver adequate service. Conversely, overshooting causes waste. That waste translates into dollars. If you can predict demand, then you can manage it. This post provides an introduction to how you can use booking forms to help manage demand. Seasonal trends are the most straightforward to account for, so let's address those first. Many industries use booking forms as part of their process to manage demand. Take the case of when you bring your car to the dealership for repairs and they provide a rental car. The dealership puts in a booking form with the rental company. The rental company uses that form to make sure your vehicular needs are met. Some industries are highly subject to seasonal demands. Hotels and airlines are notoriously swamped during the holiday season. They commonly use booking forms as part of their reservation system in order to manage and control demand. If you've ever experienced the "joys" of holiday travel, just imagine how much worse it would be without a reservation system. It would be total chaos! Seasonality is ubiquitous in business. Some experience lulls in February. Others are slow during the summer months. Furthermore, the cadence varies by department. HR may be busiest in October, while the accounting department may be buzzing as the new fiscal year approaches. All of those peaks increase the demand for testing as new processes are put in place. A reservation system combined with past trends helps to manage the test environment under this kind of load. Looking at past data is a great way to predict the seasonal cycles of a business. However, there are times when demand doesn't follow the typical cycles. We need a way to plan for those increases in demand. A straightforward way to notify another department goes a long way toward preparing for increased demand. It helps the supply side as well as the demand side. The supply side can adjust to meet future demand. Meanwhile, the demand side has a better chance of having its needs met on time. Many industries use booking forms to communicate demand for services. For example, imagine a team that's working on a software project due to wrap up in September. They will need to book resources for deployment to production. Let's say they need new servers for deployment. Sometime in July, they'll fill out a booking form describing their needs. The form will go to the server team, so they can plan ahead. The server team can fulfill the request in August or even closer to the deliver-by date if that works better with their schedule. Similarly, consider a new project that's just getting underway. The first round of testing is planned for two months out. That means now would be a good time for the project manager or test manager to put in a request for the testing resources. Let's say the test environment has unique requirements, such as specialized hardware. That request must be placed in advance so the acquisitions can be approved in time. Failure to submit a booking form on schedule would result in project delays. Or, it would cost a significant amount of social capital to recover from the slip-up! A booking form is an integral part of a reservation system. When you have finite IT resources, such as physical servers, planning ahead is especially important. Virtualization helps when it comes to shifting demands for servers. But as demand increases up to and beyond physical capacity, something must be done. In many industries, such as airlines, the cost of service increases with demand. Price adjustment is a standard method of controlling demand. Organizations with fixed assets, as in hotel rooms or airplane seats, need to keep them in use. By reducing prices during times of low demand, these companies increase usage. IT doesn't always have this luxury. Instead, IT must chase demand. But rather than simply chasing it, we can predict it. In some cases, the PMO will have to adjust priorities to level the demand for limited resources. More and more enterprises are shifting to cloud providers. Complete virtualization of infrastructure and newer technologies like containers are good news when it comes to handling demand. Cloud services make it possible to handle larger fluctuations in demand. And, they do so without reaching the limits of physical capacity. However, it's still important to control resource consumption. Cost control is one of the primary issues with cloud management. Cloud services offer nearly limitless resource consumption, at a nearly limitless expense. They must be managed effectively to control costs. Another issue is security. As much as unused servers are wasteful, they are also security liabilities. Cloud providers do a great job of keeping current. Still, consumers must maintain certain types of resources like Virtual Machines. More VMs means more time spent keeping them running and secure. The waste starts to multiply as the infrastructure and security groups have to take these additional servers into account. The additional servers not only cost money, but they add to the overall workload. That added workload chips away at the capacity of the operations teams—taking little bits away from the things that really do matter. Speaking of demand for services, let's talk about that demand for personnel. Booking forms can be used to book anything from servers to DBAs and testers. Sometimes, the demand for testers can increase beyond capacity. Let's say your enterprise is moving to the latest OS. Upgrading an OS is a huge undertaking and doing it all in one go could end in disaster. It can be ruinous to hastily make a drastic change to a single system, let alone the operating system used across the entire organization! Thankfully, OS version upgrades are a rare occurrence. But when your company makes the switch, it's a fairly massive project. You need to test all applications in the IT inventory (and even several that are not). Doing so is the only way to ensure the upgrade will have a limited impact on the business. However, this kind of massive change presents a problem. You can't throw all your resources into one project. Nor can you hold the project back by limiting supply. There are other projects, and you have to be able to manage resources effectively. An OS upgrade is a case where you have a sharp increase in demand. Additionally, this fluctuation does not fall on a typical business cycle. You may need additional testers to ensure success. Booking forms would come in from several departments to have their applications tested. You could easily attribute the increase in demand to the OS upgrade project and adjust resources accordingly. Similarly, you would need to prepare the test environment for the upgrade. 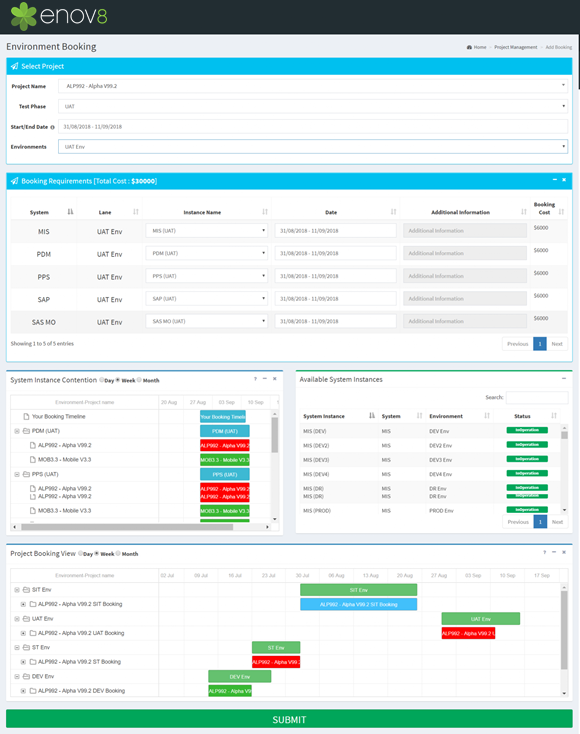 Booking forms would flow to the departments that set up the various components within the test environment. A tracking system relates all the requests back to the project. And now we've come full circle—we can see what services are needed to support the project's testing needs. In this post, we've seen how demand and capacity are related. Managing demand is important for cost control and service delivery. Booking forms are used across industries to communicate in advance. They're standardized and can be used to feed into capacity planning. In a test environment, infrastructure and staffing demands can fluctuate seasonally. At other times, they can change sporadically. When you use booking forms, you're better able to predict and manage demand. Use them and you'll reduce seasonal stresses and keep surprises to a minimum, which keeps your department on top of things! * Patch Tuesday is the second Tuesday of the month, when Microsoft releases patches for servers. A bad one can cause a lot of problems that look like buggy application code. This post was written by Phil Vuollet.